About 606 BC, young Daniel was taken from Judah into exile in Babylon to be trained in the service of King Nebuchadnezzar. He and his three companions showed great courage and trust in their God. “The Most High rules in the kingdom of men, and gives it to whomever He will, and sets up over it the lowest of men” (4:17). 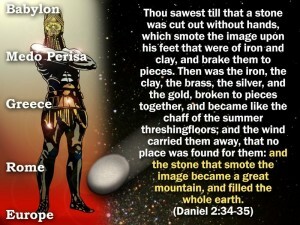 The statue’s head of gold represented the king himself and his kingdom of Babylon (2:31-35). This lasted for 70 years. Subsequent empires would be stronger, but not so wealthy and autocratic. Next, the chest and two arms of silver referred to the empire of the Medes and Persians (2:39; 5:28; 8:20). It lasted for two centuries. Then, the belly and two thighs of bronze referred to the Greek empire (2:39; 8:21), which began with Alexander the Great and later became the Kings of the North and South in relation to the land of Israel. Two legs of iron referred to Roman Imperialism, divided into East and West (2:40; Luke 2:1; John 11:48). From the conquest of the Grecian kingdom of Egypt in 30 BC to the end of the Holy Roman Empire in AD 1806, iron is a fitting symbol of Roman imperialism. Feet of iron and clay referred to the nationalist phase opened in the Napoleonic era; then and later the forces of democratic nationalism produced the strong and weak nations of modern Europe. Remnants of iron imperialism endured into the 19th and 20th centuries. As potter’s clay is pliable, so populations are moulded to the will of their leaders. Toes grow out of the feet, and are all those nations opposed to the Lord Jesus Christ when he returns. 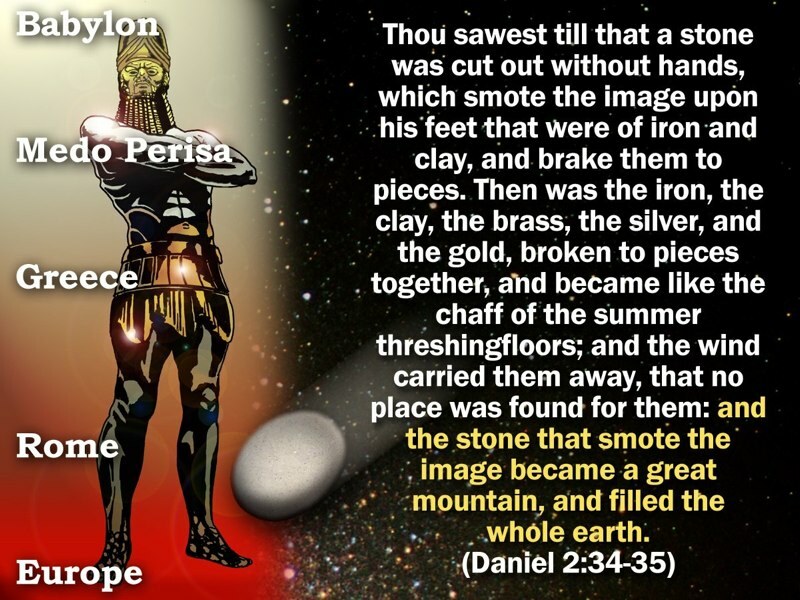 The stone that smote the image on the feet, and broke up the whole edifice of human rulership, is the Kingdom of God that will replace the kingdom of men. With Christ ruling from Jerusalem, divine authority will be extended throughout the globe. 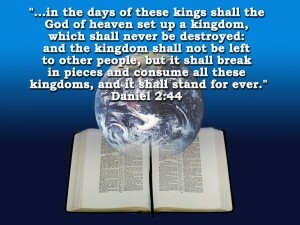 Israel’s history confirms the accuracy of this prophecy. 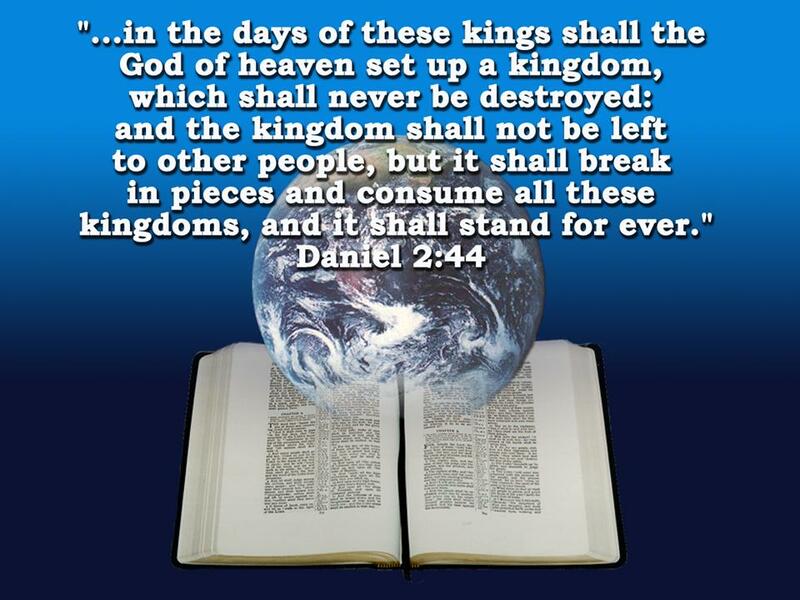 Subjected to that succession of empires and scattered into all countries, the people of Israel are now back in their land, a sure sign of the nearness of the Kingdom of God.